I grew up in a suburb called WY8, which is part of the small town of Kuruman in the Northern Cape. My father passed away while I was still a small child. I was told I was still crawling. So myself and my five brothers and sisters were brought up by my mother. Very sadly she also passed away when I was 12, at which point my grandparents took over looking after us. While I was in school I got a part-time job as a fruit picker on a grape farm called De Wet Nel Boerderye. I used to work there during the holidays and on weekends and while there was promoted through a number of positions. Mr Rafe Shabaily, the manager of the farm, really invested in me. He saw that I was a people’s person and was determined to make a success of my life and so he decided to fund my studies in Human Resources at the University of the North West in Mafikeng. Mr Shabaily funded all three years of my university studies, from books to the tuition fees and the residence. I remember the day after graduation we sat in his office and he said “Simon you must never think that you owe me a single cent”. I couldn’t believe my ears and he could see that I was shocked. He repeated it again and said “Yes you heard me; not a single cent”. I chose to go back to the farm and spend five years working there as a way to say thank you to Mr Shabailyand the management of the farm. The passing of my father while I was so young propelled me into becoming a photographer. I don’t have any trace of what he looked like, and as a tribute to him, I began taking quality photos of the community so that one day,when their loved ones pass on, they can show the new generations what their late family looked like. Using an analogue Minolta camera this calling became a small business for me while working at the farm. Fourteen years later my side-line business is now my main source of income and has grown to include videography and music. Attending Solar Capital’s Entrepreneurial Development Programme gave me the added push I needed to expand my vision.The funding from Solar Capital allowed me to buy hi-tech equipment which increased my earnings substantially. I then used this extra revenue to buy a people carrier which I now use to transport KFC employees to and from work. All in all this process allowed my income to double! My next dream is to run a successful brick selling business. I have already started on this, but I need to start marketing this for it to become successful. The assistance given to me by Mr Shabaily when I was younger taught me to assist wherever I can and to bless the people around me with whatever I might have in my hands. It might look small but to someone near me it can be the biggest thing he / she ever wanted. I have encouraged three of my helpers who work with me at the bricks manufacturing business to go back to school. Two are now doing hospitality and one is doing public administration at the De Aar FET College. I am so proud of them for having seen the importance of going back to school. The opportunity afforded to me by Solar Capital’s Entrepreneurial Development Programme helped me in fulfilling my dream to become the businessman I am today. I want to pay forward some of this good fortune, and so I am now mentoring a young man by the name of Lee Evans in photography. He is a participant in the Entrepreneurial Development Youth Programme run by Solar Capital and I hope I can help to inspire him and assist in growing his passion for this art form. 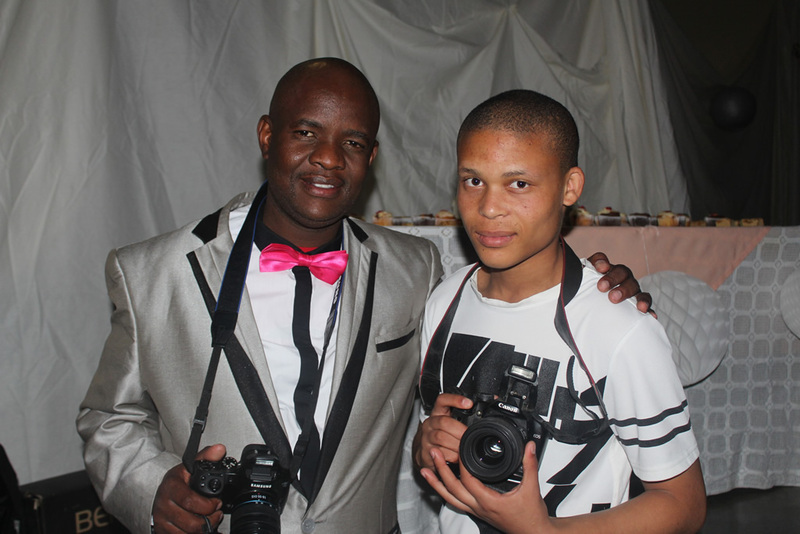 From left: Simon Dithebe and his mentee Lee Evans.